The Seminary Archives in Gettysburg, Pennsylvania hosts undergraduate and graduate students with an interest in careers in archives and museums for internships which allow students to do professional work and hands-on learning in small archives operations. 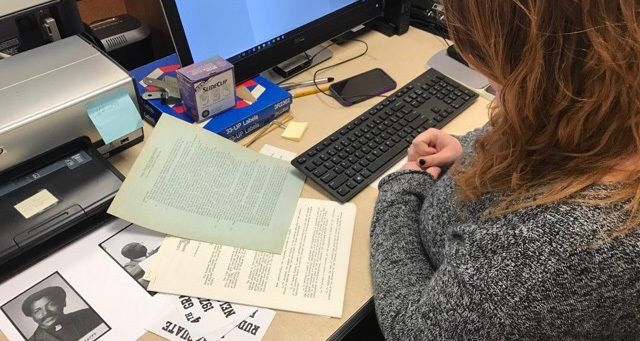 Interns will develop an understanding of the interrelated roles of archives and library departments and may also have the opportunity to develop and work on special projects tailored to their needs. Students with strong backgrounds in History, Public History, Archives, Museum Studies, Museum Education, Historic Preservation, and Religious Studies are encouraged to apply. Internships may be arranged to accommodate any semester throughout the year ranging from six to twelve weeks depending on school requirements and archives needs. Please note: Intern must be willing to work in an environment that involves exposure to dust and/or mold and can lift up to 40 lbs. Requirements: Completion of at least the introductory courses in public history and/or archives principles and practices is preferred. Good computer skills. Good communication and organization skills. Interest in Lutheran Church history is a plus, but not required. To apply for an internship, submit the following information to Sheila Joy, Archivist at sjoy@uls.edu. Please make an apointment before visiting. We are only occasionally able to accommodate walk-in requests.